From the Anthony Award-winning author of the immensely popular Sookie Stackhouse mysteries comes the first book starring Lily Bard, a reclusive cleaning lady with a penchant for karate. When Lily finds and reports a dead body, her shady past and connections to potential perpetrators make her a leading suspect. I loved the Southern Vampire stories until Harris caved to True Blood fans. When I heard that this new series was going to be turned into a series I jumped to read it. What a waste of money. This story can be summed up as: a bunch of people in a small Texas town who are weird and may be supernatural (some are) but no one likes to talk about anything. This was like a bad episode of Seinfeld where you didn't know what was going on and honestly just kept listening/reading so you didn't feel bad about wasting your money on this book. The narrator had some good voices to distinguish between characters but her phrasing could use work. At the end of every chapter I felt like she was supposed to say more, but didn't. That could be to do with the absolute travesty that is Harris' writing. I'm not sure what to think of this book. 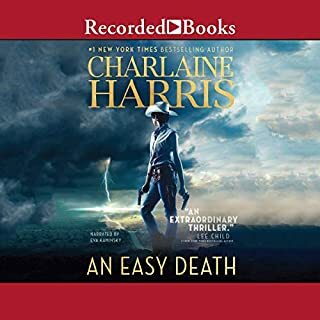 It's very different from Charlaine Harris' other series. Although it included characters from other series. That was a surprise that I appreciated. Especially since I wish The Lily Bard series continued. This book started off very slow with just a hint that something good was coming. I had faith in Harris so I continued. The book didn't really pick up until the last few chapters. Then things took a very strange turn. I won't spoil the ending for anyone but it's rather shocking. I can see good things coming and I will get the next book. I'd rank it just above chick-lit. First off, I chose this book because Susan Bennett was the narrator and she is THE BEST of the female narrators. If you haven't heard her read "Bite Me" by Christopher Moore you are missing out. This book was an okay, easy listen. Hard to classify it as a vampire book since they really didn't feature much. Main protagonist was weak but not totally unlikeable. It kept me listening, just not fascinated. Like I said, probably best for the reader into light, uncomplicated novels or chick-lit. 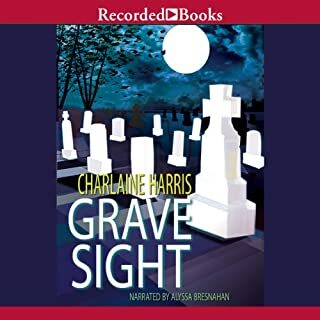 Story Thoughts: I am a self-professed fangirl of Charlaine Harris' ability to write a good mystery. It is the main reason that I love her stories. She writes a darn good "who-dun-it". Midnight Crossroad is no exception in that aspect. Once we got to the mystery, the book really took off. I was invested and a little bit caught off guard that one of my off-the-wall guesses was right (granted I only guessed off-the-wall because sometimes Charlaine will do that). Even though it takes a bit to get to the mystery, it really was worth the journey. My only complaint was the pacing for the first 1/3 of the book which happens a lot in first in series. Especially when you are introducing a town as quirky as Midnight, TX! Character Thoughts: Going to admit that it took till the last quarter of Midnight Crossing for me to get into the characters. In the beginning, I just couldn't quite connect with them. There were too many characters but towards the end I realized why. Now, I am invested in Fiji and her familiar. I was happy to see characters such as Manfred and Arthur from her other series. Overall, I am sure in the 2nd book I will have more favorites! 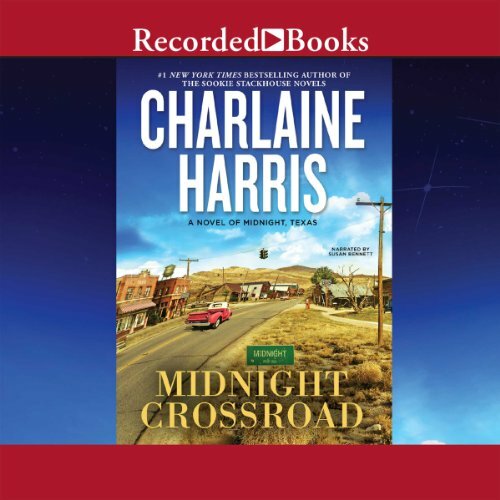 I thought Susan did an excellent job with the narration of Midnight Crossroad. She managed to capture the quirkiness of the town just right. She showcased the large cast in a way that made each one stand out and be completely unique. I will be continuing this in audio. Final Thought: Rocky start but excellent mystery! I am a Charlaine Harris fan, but this book was too slow. it captured that s all town feel. she developed her characters nicely and she made the reader want to be a part of this community. 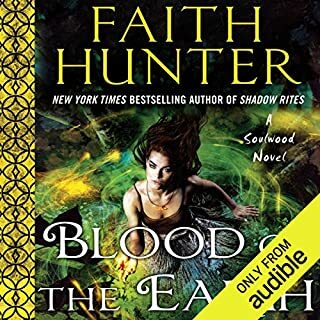 The ending has a good twist, but overall I felt underwhelmed and this is the first audible I had to force myself to finsh. I was waiting for magical battles, or steamy scenes...not this book. I expected something faster paced from Harris. just okay. I won't listen to the next book in the series. If you could sum up Midnight Crossroad in three words, what would they be? Atmosphere, Midnight Crossroad is steeped in it, warm, familiar, comfy, scary and fun. Loved catching up with old favorites: Bobo Winthrop from the Lily Bard series, Manfred Bernardo from the Harper Connelly series and the sheriff from the Aurora Teagarden series. Great cast of new characters as well. 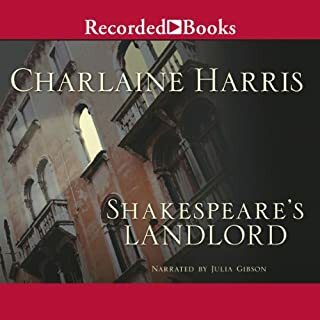 After being disheartened over the last Sookie novel, this was a happy surprise and vintage Charlaine Harris. Back in my happy space. Loved the performance. Susan Bennett's voice dropped me immediately in the town of Midnight and kept things exciting and enjoyable. Very satisfying all the way round! What other book might you compare Midnight Crossroad to and why? What does Susan Bennett bring to the story that you wouldn’t experience if you just read the book? Loved the performance. I had bought the Kindle version and started reading, but realized I did want some audio atmosphere. Susan Bennett's voice dropped me immediately in the town of Midnight and kept things exciting and enjoyable. Who was the most memorable character of Midnight Crossroad and why? Manfred Bernardo, but I probably say that because he is a favorite character from the Harper Connelly series. 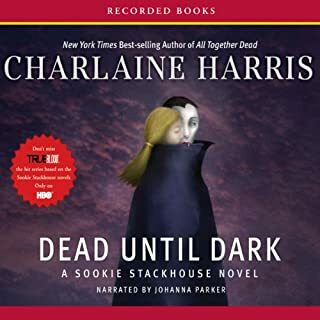 I am not a Charlaine Harris fan, and I didn't like Dead Until Dark. 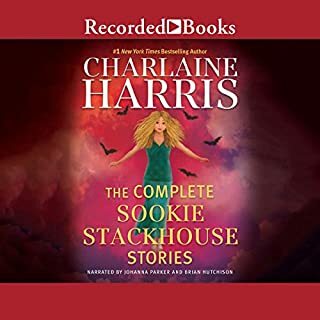 I thought it was rather juvenile and the characters were nothing but annoying, and I never read any more in the Sookie Stackhouse series......but here this was on sale, and not part of that series, so I thought I'd try it. And it was pretty good. I liked the kind of quirky characters in this odd small (very small) town, even though nothing really happens in this book of much intrigue or importance. There's a bit of a mystery towards the end, but if you're reading this don't look for any real plot - it's mostly an introduction to the various characters. But I liked the little collection of residents: some supernatural like a vampire, some uniquely gifted like a psychic, and some plain old ordinary humans, like the sociopath next door. I'm not disappointed by my look into Midnight Texas, but I don't think I'll go back for more. I have read pretty much every full-length novel CH has written. From Aurora Teagarden, to Harper Connelly, to Lily Bard, to Sookie Stackhouse. So, I've invested a fair amount of time and money into this author because I have found her books entertaining on some level. They aren't literature, but they have been entertaining fluff reads. Until now. I think she needed a break following the disaster of the final Sookie novel. I almost wish they could recall this book and reissue it in a year once it had been edited. I didn't know this book was going to be about Manfred and Bobo, and I was really excited! Except the writing and characters were so dull and flat, I couldn't even finish the book. Manfred was an awesome character in the Grave Sight books, and I just don't get what went wrong. It was like it was written to fulfill a contract without any joy or interest in the future books. I loved hearing all the characters speak and found them all very entertaining. I was surprised, as reviews on this book had been mixed, which is why I put off buying it. However, I really loved it. This book reminds me a bit of the True Blood show, not so much the books she wrote. The characters are all sorts of twisted, but still somehow likable. I enjoyed the scene in the pawn shop where two of the characters get creative in resolving a problem for Bobo. If you could take any character from Midnight Crossroad out to dinner, who would it be and why? Fiji hands down! She such a riot and a witch, what's not to like? Honestly I really loved this book and was sad when it ended. I have to say I enjoyed it far more than I thought I would. It is more comparable to the True Blood TV show, rather than the books it's based on....so, if you like the show, you might like this story.